Here is my another excellent blogger beta template.The template was originally a wordpress theme designed by Lorelie for wordpress.org users.Now, I converted it to the XML Blogger beta template. You can view the Live Demo here or look at the above screenshot and download this beautiful template here. and i plan to also posting about your work there. Your templates are very cool but there seems to be an error on this template. May you please help us fix that error? Just download the template and unzip it and you will see an xml file. If you still have any problems... feel free to ask me again..
Is there a way to add a profile section back in to this template? Thanks! Hi. I love this template but I miss the navbar please tell me how to get it back? thanks in advance. We both think that you are doing an incredible job here. Love your templates. I am planning to create my own blog and I will like to use one of your templates, still don't know which one. Hi Maria, Thank you very much for your wonderful comment. Hi, If you want guys to put your profile, simple use the 'Add a Page element' and select the 'profile' and save the changes.. I love this template a lot. Is there a way to make it a three column? i agree with 'syn'--is there a way to make this a 3 column template? or a way to add widgets to the footer area? thanks! I want to be able to display not only the time, but also the date on which a post was published. But no matter what I do, I can't get it to come up. (I'd even settle for just the date.) It's set to show both in the 'Configure Blog Posts' menu, but even if I set it to only show the date, it shows the time instead... help? and you see the option TIMESTAMP FORMAT. Now,select the one that you like from the dropdown and Save the Changes. Does this mean there isn't a simple way to make it a there column? I really love the design but need three columns. Thank! the header graphic is just around 700px and this layout is best for 2 columns.If we made this into a three column, the 2 sidebars and the middle body part will be too thin.That's why I didn't did it. Just wanted to say this is a beautiful template. Thanks for porting this over to Blogger. I read through the comments and found a few of the things I was wondering about (navbar included ^_^). Gorgeous template!! Thank you so much! I love this design! Thanks soo much! It's great template. But I have small problem. Everything was working but suddenly my post start to show bottom of page. Could you check it for me pls? hi dude... if your widgets like adsense,etc exceed the sidebar width.. that will happen. So,please make sure of your sidebar widgets. It is nice templates,it'color combination is good,I like it's design,I want to download your free templates,I have web site www.webdesigningcompant.net. Can you please make it a three column, see if you can resize the header image. I want to test it. It's gonna be cool to have two and three column templates. The seach bar is in the middle of my first post... Any suggestions? Saandrine M You are getting this error bcoz of cockies simply delete your browser cockies and then sign in again this you will not get the error. how do I change the FONTS and Colors? The template is beautiful...thankyou very much. I would also like to know how to change fonts and colours, for the text. Also is there anyway to get rid of the RSS button and the search box? I like your template so much. But the sidebar is too narrow. When I added favourite blog list to the side bar, the web link is too long that it caused the contents to be pushed to the bottom. And also, my Archive titles are all appeared in 3 lines long. Is there anyway that I can widen the sidebar and the contents? Any way I can fix it? I really like it so much that I hope you can help ^_^ Thanks! First of all congratulations for you templates, it was very difficult for me, to have to choose one. Second, can i put your link on my blog? And didn´t work :-( What am i doingo wrong? Thanks in advance. And once more congratulations. Love this template, but the date does not show up, only the time. What do I need to change? Thanks! Hi Gayle, you have to change the timestamp format by going to Settings » Formatting. Hi Noc@s, I visited your blog...and found no problems... I think you got it now. Hi Amy, unfortunately, I hosted all the image files to another servers..that's why the images are not showing. Download a fresh copy of the template and follow the instructions here . nice template but, how can I put a new entry on my blog?? or haw can i go to my settings? Yes in fact, i got it. This worked. I absolutely love it. Thank you, thank you, thank you! I know you get some pretty repetative and basic questions, but I want you to know that your templates are awesome! I love your site. I can't thank you enough for all your hard work... You are awesome. Though... I have a lil problem. I saw somebody having the same one in one of the comments, and it was sorted. The bad thing is I can't find the way to make it work. I would like the date to appear, not just the time, in the post... I've tried the way you recommended but not working. So was wondering if there is any other way to do it, maybe "playing" on the html code (never know!). Another thing I would like to be able to do (though I understand it might not be possible) is having it all in 2 columns but then, in the foot of the blog, after all posts and all that... having 3 columns. Do you think that can be done? Btw, CONGRATS for all your templates, they rock!! hi.. i love your template though i cant seem to find the search box and the rss subscribe button.. how can i add them to my page? Hi Kranthi, I don't get what how to put in the pictures so it looks like the live demo. i really like this template can i use it for my student blogs project? Excellent design! But need to be little professional. I love your design. I have changed the setting to add the date as described earlier and it still only shows the time. Can you please assist? Thank you, Kranthi. I love this template. But I have a problem. Ican't find the "post quick edit button" when I use this. I have tried some steps to solve this but no use. Could you give me some suggestion, thanks a lots! hey why i can't download the template? I there..and thanks for the lovely template.. I have downloaded the template but i cant see the pics of the header and stuff ! Can i upload on my photobucket the pics ? how do i do that ? i just discovered your site...and i really find it very good. Hi I have install this template to my Blog and it is really very beautiful but i want to to create one more categories and name it links and bellow i want to appear the site i have so when visitors click on it can visit my site.How can i do that?What code can put? How do I get the actual day & date to show up on the Japanese Fleur template? 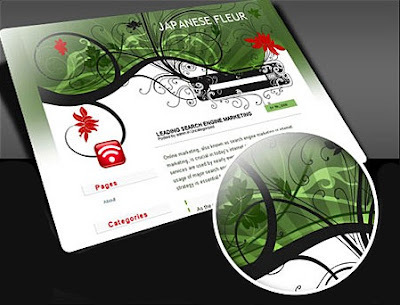 How do I get the day & date to appear on the Japanese Fleur template? In the settings it says it is there, but I can't see it! It's very beautiful. I am right now testing this template. Do you know why it's not showing me rating stars when i am adding? btw, another question to ask.. bout the background colour, can we change the colour? it is nice now.. the green upper background is nice.. juz wonder how will it be, if the white lower background can be changed into black..
Merci bien de ce template. Je le trouve magnifique. Comment faire pour voir apparaître la date des post en plus de l'heure ? How can I configure the date? hi! congratulations for your blog and your templates! they are very beautiful! I got 2 for my blogs! I love this template its gorgeous. For some reason though on IE its showing a huge white gap between the header and the first post. Do you know if there is a way to fix this? Thanks again! I love this template too, but it seems to convert all the text I type in to Japanese characters, is that intended? थे फर्स्ट फेव वीक्स this is something from my page. Your Template is so cool, but why my blogger cannot accept the HTML? the operator said:The document type declaration for root element type "html" must end with '>'. I love this design. Sadly, your photobucket bandwidth has been exceeded so the images do not appear. Rather, an ugly box that says PHOTOBUCKET YOUR BANDWIDTH HAS EXCEEDED UPGRADE NOW is displayed. Are you thinking of upgrading? If not, its no problem, I can find another template. Its just that yours is really the best! I´m using your beautiful template, for some time now, but from yesterday there are pictures everywhere, that telling to upgrade photobucket pro. You can take a look at http://yksvahvaklass.blogspot.com/, what I must to do now to get them away? it didn't work for me either. keep getting an error message. Do you know why the photobucket pictures are not working? pls help!i like ur temaplate but i just have a tough time uploading it..i just don't know how to do it..it fails everytime. I just wanted to say THANK YOU for such a beautiful template, and for so kindly answering people's questions and requests here! I just set it up this afternoon and so far haven't had any problems that you didn't already answer. I spent all afternoon looking for a template in exactly this style and am thrilled to have found this one; thank you so much!!! I know you said it can't be a 3 column and thats ok. But is there a way you can make a wider version by changing the size of the header design? I am trying to embed a shop and run into a scrolling issue. i really wanna see the layout of the blog with three column. Can you make it for me? thanx q...i've got it..tq..4 da template.. I inserted the template but one error is coming: the post are coming very below, means after the left sidebar. Can u tell how to fix it. I have been successfully using this template for a while now and I love it, but now it's not working. It says something like photobucket exhausted. Does this mean that I need to buy something from photobucket to continue using it? My blog is www.amyandfam.blogspot.com. Thanks! The "Post a comment" link does not seem to work in the template and so the readers cannot leave any comments. Is there a way to change that? Thanks! Hello Kranthi Sir, i need your blog templates can u give me the link of that one. Hi Kranthi, I love all your templates and have used them in all my blogs, I also loves your 'meaty' content that's full of tips and clear steps that i doesn't have any problem to install them.I have put your link in my site and also give some reviews in my blog.Keep on the good work and may God bless you. hi kranthi! nice works you have here. im using this, but the date doesn't appear.. can u help me with this? thanks. i love this template very much! Thanks a lot for this beautiful template and the tips in the comments - it helped me a lot for set up. I love this template. But I wonder if you can change colors. II really like it, but green... mmm... I don't know, I prefer purple, or just white, gray maybe. I love your template and have it installed in my blog. However, "Post a comment" doesn't seem to work though. I really want to have your template, so I would appreciate your help on this. Thank you very much for creating such a beautiful template! why my fren cant comment at my post? I have messed up something in my HTML can you look at my blog and tell me what I need to change so the body comes to the top. Banwidth exceeded for the RSS Feed image...Help! It seems your photobucket bandwidth limit has been exceeded, therefore the pictures of the template dont display anymore. Kranthi, all of the images in this template errored with bandwith exceeded images on me yesterday. I uploaded all of the images and changed the HTML per your suggestion, and it worked with two exceptions. First, there is no rss.jpg anywhere in the HTML for the RSS subscribe feature. I ended up deleting this to get rid of the ugly error box. Second, there is no file for the GO icon for the search box in the HTML. How can i insert the reaction vote on every post? I enabled it (press edit Blog Posts in layout > page elements) but nothing happens. have the same problem with the photobucket files. Hey wow I love this template...good job. I had a really quick question though, for some reason my comment box isn't working do you know how I could fix that? Hi, I have the same issue with the photobucket error. I since just went to a default template with Blogger and the photobucket error image is still up. What do you suggest? Hi, I am having the same trouble as Shela - I used my own hosting for the images (no problem) but the code has no mention of the RSS or GO icons, leaving only an ugly mess in their place. What can be done? @ Sheila: I have the same problem and it started on 25th January, too. If you find anything about it in the meantime, please let me know at d3m3ntik@hotmail.com. Thank you! Kranthi, I love the template but I have the same problem as Shela: bandwidth exceeded. Can you tell me how to fix this, step by step? I liked your background, but now I can't get it fixed back the way it was. How do I take off the photobucket stuff? Even when I am using a blogger background? can please give me the detail because i can't unzip the folder. my company didn't allow it. Congrats on your lovely exotic template. I simply loved it! Anyho, I didn't know what I did, my comment box suddenly disappear!Help! http://draft.blogger.com and Settings > Comments > Embed comment form below post. Err..my comment box did work! Sorry for the hassles ya! Your template is stunning. Except that I'm getting the bx-bliced error when I upload any new template. Hoping to have this problem resoved soon, after which I can upload your template. I also think its very nice of you to answer so many questions patiently. All relative dodos like me really appreciate it. This template looks great in Firefox but in IE, the actual posts don't show up until below the widgets on the left...any ideas? When I created an unordered list, it looks like it is double spaced (old school term I know), but when I check my code nothing like that is there. How do I modify the XML so that my lists are a little more compact? Hi Kranthi, this template is beautiful.. I love this template. It is BEW T FUL and pretty easy to customize. 1) How do I modify the XML so that my unordered lists look like they are "single-spaced" instead of the "double space" look they have now. 2)I figured out how to add a widget above the blog posts, but I'd like to add a widget at the bottom of the blog post section. Any thoughts? Does this not work on macs? I tried to download it and all it seems to be is a game! Help! I love the template! I downloaded this template awhile back and still love it. Thanks! Oooooohhh ... i am getting a nasty bX-hwogca error for this beutiful template.Help me to get this template without any errors please. Comment box doesnt work in this teplate :( HELP ? I have looked at a lot of templates and this is still my favorite. Sorry... No support available for blogs that removed credits on footer. Hi, I visited your site again.. I think the search box is working fine now...? I can't seem to enlarge the font-help! Love your layout! Love it! How do I increase the font size? When I go to Fonts/Colors Tab in Blogger there is nothing listed there...hlep! Good one! Take a look. hello. I love this template. I wat to put it on my blog but I don't know how to unzip it. help? I really want this template!